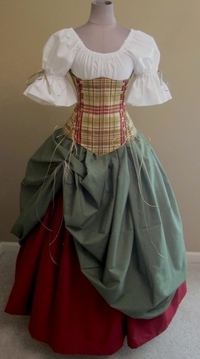 When it comes to Renaissance, medieval, and even steampunk costumes for women, one of the most common features is the waist cincher. Waist cinchers and corsets may have fallen out of fashion in today’s world, but for centuries, women wore these garments daily. The sight of waist cinchers and corsets immediately reminds you of fashions from long ago, making it easy to see why they are such an integral part of Renaissance costumes. Waist cinchers and corsets have a very rich history in the world of fashion, and some of the story might be quite surprising to you! While waist cinchers and corsets surged in popularity during the 16th century, there is evidence that the garments were first introduced to the world around 2000 BC! There exists an image of a Cretan woman wearing something that looks uncannily like a corset. The history of waist cinchers in a little bit fuzzy, but we do know that the corset, as an undergarment, was first brought to France to Catherine de Medici in the 1500s, where women embraced this unique look. During this early period, the main purpose of waist cinchers and corsets was to emphasize a woman’s bust. These corsets pushed women’s busts upwards using stiff linen and wooden bars. Technology sure has improved since that time – we no longer use sharp and potentially dangerous wood! Our waist cinchers and corsets are made using extra soft fabrics and flexible boning to make sure that your waist cincher is not only stylish and old-fashioned looking but also comfortable to wear. At Pearson’s Renaissance Shoppe, we have a huge variety of waist cinchers for costumes of all styles. If you are looking for something with a Scottish twist, take a look at our Scottish Plaid Bonnie Lass. This beautiful under-bust corset features a great plaid pattern that will give you that perfect Scottish look. If you are intending on doing a little swashbuckling, you can’t go wrong with our Buccaneer Pirate costume. This selection comes complete with a lovely under-bust corset and two full skirts, great for sailing the high seas! No matter what kind of waist cinchers and corsets you are looking for, PearsonsRenaissanceShoppe.com can help you complete the look. Don’t “waist” any time – visit our store today!